Carol is two time Oscar winner Cate Blanchett’s second time working with visionary Todd Haynes (I’m Not There, Far From Heaven) and her second time in a film adaptation of author Patricia Highsmith (The Talented Mr. Ripley). Returning once again to the 1950’s, Haynes has a particular flare for embedding the audience in the period. 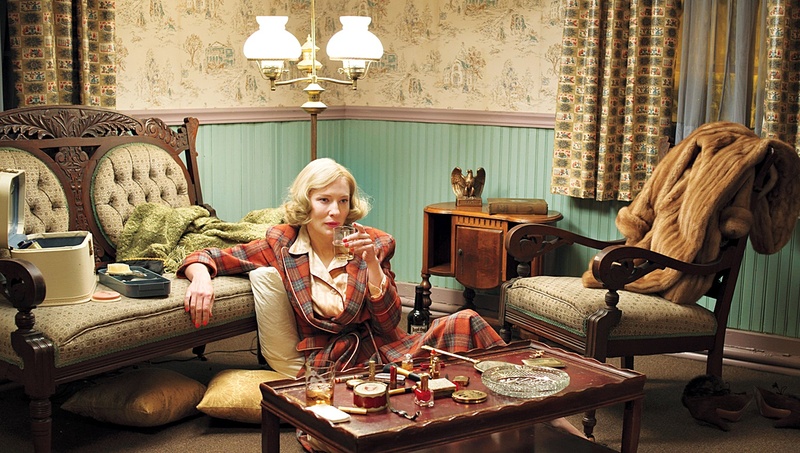 Carol adds to the number of LGBT films that have hit cinemas in 2015. This one actually started its journey at Cannes, where Oscar nominee Rooney Mara (The Girl With the Dragon Tattoo, Pan) won Best Actress. Carol lacks the structure and often the emotion of Far From Heaven (2002), which might make it a difficult experience for mainstream audiences. Haynes is very interested in capturing the longing between the women, the restlessness of the period and society struggling to cope with individuals acting outside their appropriated place. Impressionable department store clerk Therese Belivet (Mara), spots unhappy housewife Carol Aird (Blanchett) for the first time during the holiday season. Therese impresses the soon-to-be divorced mother with her wide eyes and knowledge of model train sets and how working in the elite store makes her nervous. Carol originally entered the store looking for a doll for her young daughter, but gets so caught up in conversation, leaves her leather gloves on the counter, providing Therese with an excuse for further contact. Soon, Therese finds herself falling in love with a woman in the middle of a messy custody battle, and a husband (Chandler) who refuses to accept his wife’s alternative lifestyle. The visual world Haynes creates is the most fascinating, the true lead of the film. Carol’s biggest disappointment is the failure to really tear into the subject matter. Everything rides on the surface, even the performances rarely increase in decibels, even when boundaries are crossed. The visual world Haynes creates is the most fascinating, the true lead of the film. It’s also intriguing to watch the males of the story struggle to understand why these women don’t want or need them. “Physics, you either are attracted to people or you’re not,” Therese says, in one of the only conversations in the film that actually addresses the “moral misconduct” as it’s referred to in this time period. Composer and frequent Haynes collaborator, Carter Burwell keeps the music subdued and minimalist, unlike his memorably divine score in Far From Heaven. For the second time this year Blanchett seems to have been cast because of who she is; her repertoire, fame and cultural fascination, more so than for a performance that requires her one of a kind transformative ability. Her performance as Carol is subtle and doesn’t really leave an impact until you realize its effect on you long after the film ends. Neither Carol nor Cinderella provide the chameleon like actress with material that knocks the viewer to the floor like her other work. Still Blanchett’s involvement (including executive producer) brings prestige to the picture which should do very well this awards season. Mara, who will campaign in the supporting actress category gets the films major character arc and affords the 30-year-old her best work to date. Carol often functions more to create conversation and make cinematic statements than to make the audience swoon or stir the heart. For so many brilliant individual parts, Carol never becomes wholly satisfying.